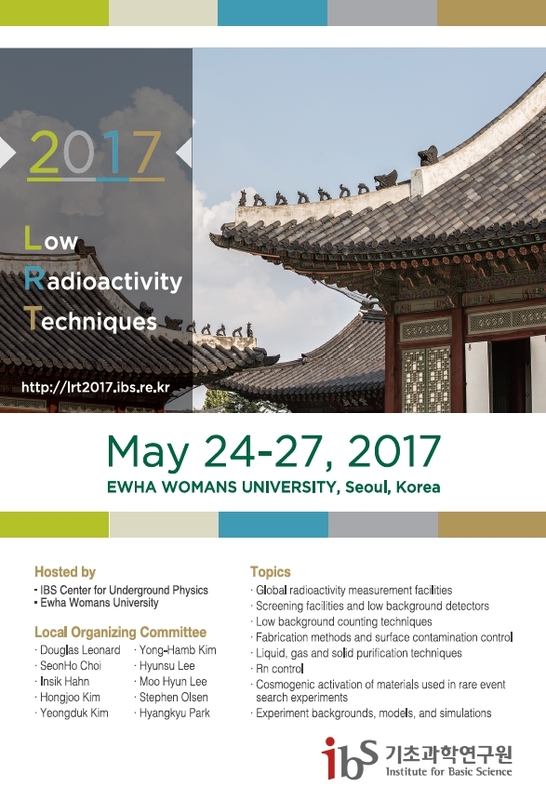 LRT 2017, hosted by the Institute for Basic Science (IBS) Center for Underground Physics (CUP) and by Ewha Womans University. The Low Radioactivity Techniques (LRT) workshop series examines topics in low radioactivity materials and techniques, a fundamental aspect of rare event searches. Topics include global radioactivity measurement and screening facilities, low background counting techniques, purification and contamination control, Rn control, comsogenic activation of materials, and backgrounds and simulations for rare event experiments related to dark matter, solar neutrinos, double-beta decay and long half-life phenomena. This conference’s wide scope includes all aspects of the development of low background detectors and techniques. The goal of this workshop series is to bring together experts in this field for presentations and discussion covering broadly the issues of low radioactivity techniques. The intention is to foster and continue the collaboration and resource sharing required for new generations of detectors to be developed at underground facilities. LRT2004 inaugural meeting, hosted at Laurentian University in Sudbury, Canada. There will be an optional all-day Excursion on Saturday, May 27 to the Yang Yang Underground Lab (Y2L) at the Yang Yang Pumped Storage Power Plant near the town of Yang Yang on the east side of Korea. At 800m depth, the drive-in lab hosts the KIMS and COSINE dark matter experiments, the AMoRE double beta decay experiment and a number of HPGe detector systems. The bus ride will provide a view of the mountainous country side of Korea often missed by visitors to the country. Mark your calendars and plan your flights accordingly. Submissions will be collected after the workshop and will be published online and printed in a bound proceedings book mailed to all participants.